My husband and I moved to Tampa in 2011 and we quickly fell in love with the passion around food in this city. Over the years, Tampa Bay has continued to wow locals and visitors with the amazing talent based in the area. I clearly remember the day in 2014 when Richard Gonzmart, owner of Columbia Restaurant Group announced he was resurrecting a place called Goody Goody. Tampa went crazy. I had no idea what was going on but I had friends going nuts about bringing back the famous burgers and butterscotch pies. Although I never heard of Goody Goody until that day, I knew this was going to be a special place with Gonzmart's passion to make everything above and beyond perfect. 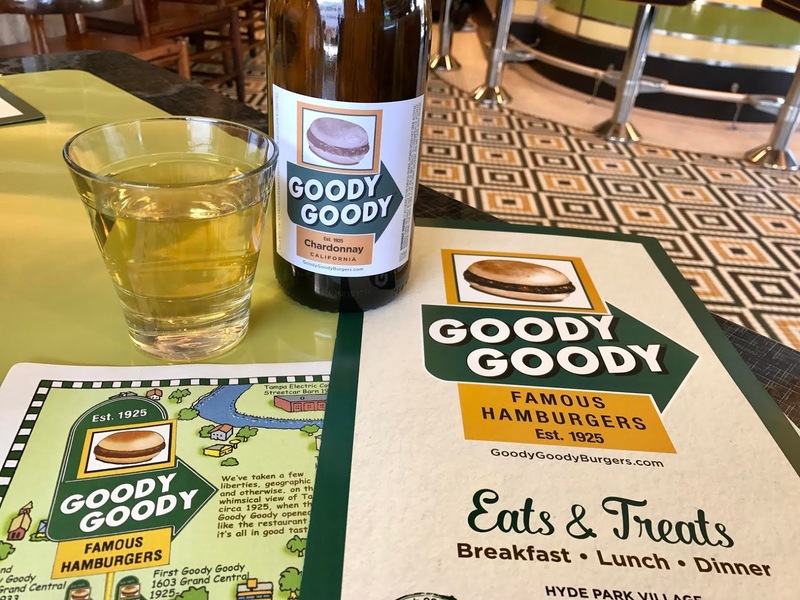 Over the past two years, I have followed along with the hype and looked forward to the day I would finally find out for myself what Goody Goody was all about. Richard Gonzmart bought the original recipes and the original 1940's sign which you will find outside of the building on Hyde Park. 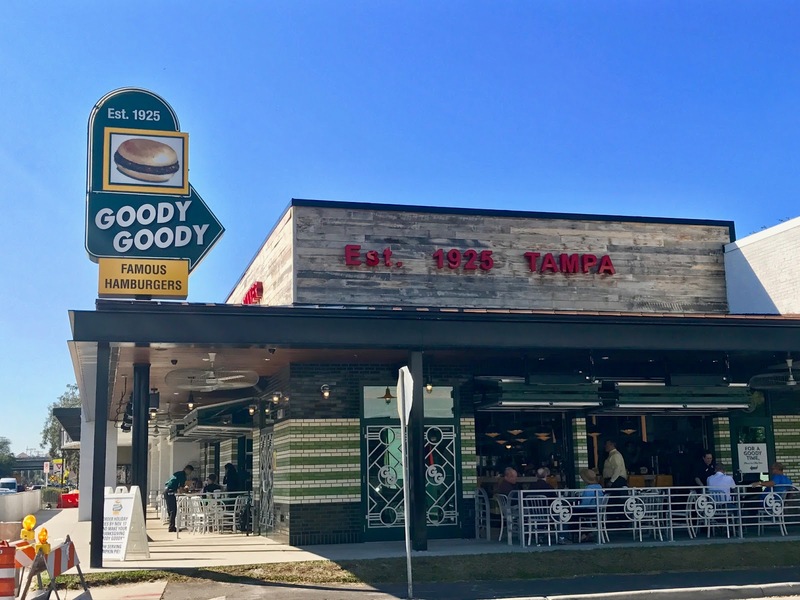 With Gonzmarts passion for food and the Tampa Community, I knew years before it opened that Goody Goody was going to be an amazing place. Two weeks ago, I got the opportunity to sit down with Jeff Houck, Marketing and Public Relations Manager for Columbia Restaurant Group, who you may remember as the former Food Editor of the Tampa Tribune. I stopped by to not only check out Goody Goody but to also try out their private label wine. That day, I finished up a week in LA and Nashville and headed straight to Goody Goody from the airport. 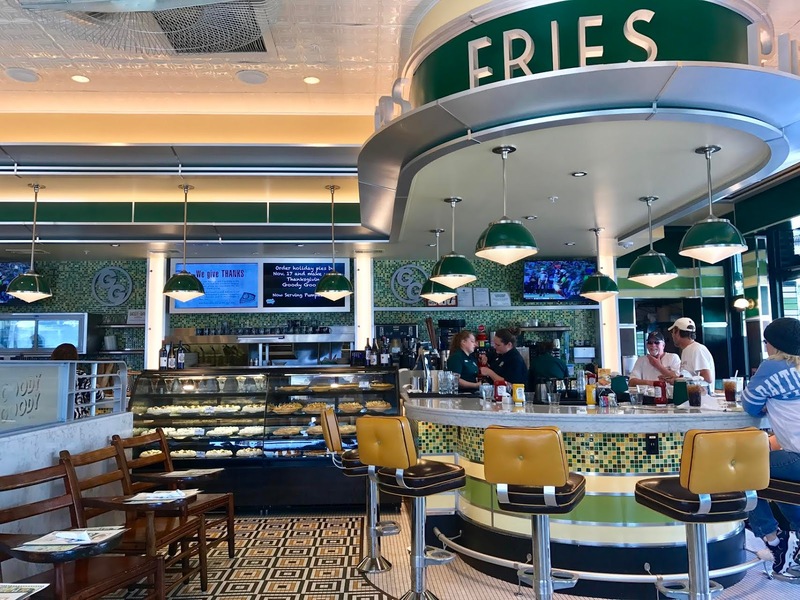 When I got off the plane, I noticed a coming soon Goody Goody logo in Tampa International Airport - it was like burger fate was calling my name. It was 2pm and the place still had a large crowd. The first thing that caught my eye aside from the wine was the pie display (which the wine sat on). Now, I will be honest - I am not a huge fan of pies but these looked amazing and I looked forward to trying one at the end of my meal. Jeff and I chatted a bit about Goody Goody's history and what Gonzmart did to resurrect it's legacy. 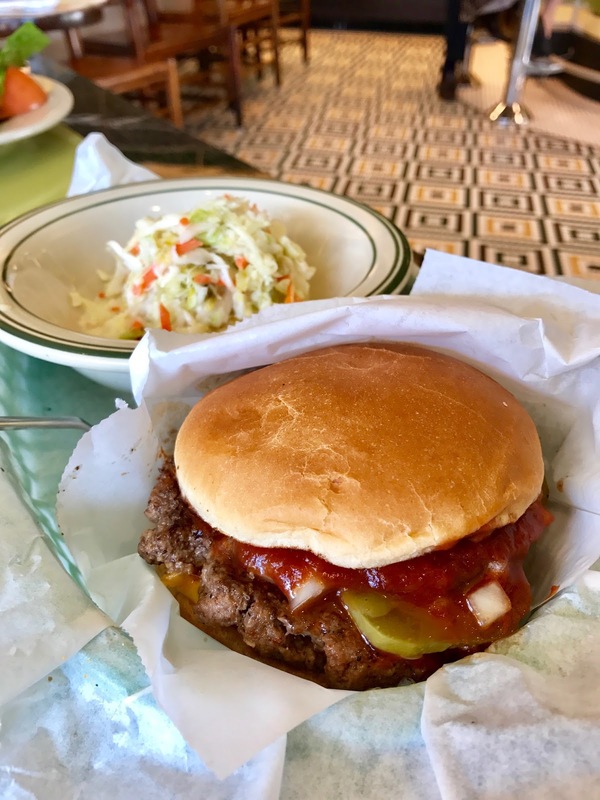 One thing was certain from the beginning - people wanted the original Goody Goody burger back and not a fancy revision of it. The famous Goody Goody POX stands for "Pickles, Onions, Special Sauce". Now, you're probably thinking this sounds similiar to another burger with pickles, onions and special sauce but I am here to tell you - not in anyway the same thing. Goody Goody originally used BBQ sauce and eventually replaced it with The Comeback Sauce. This burger wasn't thick. This burger wasn't cooked to a medium rare like I normally prefer. This burger wasn't the prettiest thing I've ever seen. BUT this burger WAS out of this world delicious and left me in awe. You could tell they used Fresh from Florida Beef for their thin patties. No fillers found here! I couldn't leave without trying a variety of items on the menu. Jeff made some suggestions and I followed his lead. One item that was very popular during the summer was the Black Eyed Peas salad. This salad was light and refreshing, made from scratch black-eyed peas, diced onions, roasted peppers, jalapeños, tomatoes, cucumbers and cilantro marinated in olive oil and vinegar. It was the perfect amount of flavor without being overwhelming. I may just use this idea for our New Years Dinner instead of making black eyed peas the traditional way. Those looking for a light meal will find a variety of salads on Goody Goody's menu. Plus you can add proteins at a very small up charge (only $4.95 to add sirloin?!). Now, I LOVE Ahi tuna more than the average person. However, I am very very picky about where I order it from. A diner is likely the last place I would even consider ordering Ahi from. Do NOT let this scare you away at Goody Goody. I was blown away by their Ahi Tuna & Avocado Club. Made with fresh seared Ahi tuna and sliced avacado, topped with spring greens, red onion, tomato and sun-dried tomato vinaigrette on toasted wheat bread - how could you ever go wrong? Although I enjoyed every single bite of that burger, I was wishing I slowed down to allow more room in my already full belly for this delicious sandwich. Along with this sandwich, Goody Goody offers a variety of items if you aren't in the mood for a burger. You can find pretty much anything on the sandwich list... a fried clam sandwich on authentic Tampa made Cuban bread, a Fresh Florida Grouper Sandwich, even a retro egg and olive sandwich. Let's go back to the wine. It's not every day you will find private label wine at a Diner (but Goody Goody isn't your average diner either). The wines are from Rutherford Estate in Napa Valley. I tried the Chardonnay which was very good. It wasn't too oaky or fruity and had the perfect amount of cream to it. Along with the Chardonnay, Goody Goody also has a Cabernet Sauvignon and offers one wine that isn't part of their private label, Colby Red which supports charities that promotes heart health. OK friends, it's pie time. As mentioned earlier, I am not a big fan of pies. I am however, a huge fan of butterscotch, so the famous butterscotch pie has had me curious for quite sometime. Although I was so full I could be rolled out of Goody Goody, this pie knocked my socks off. It was perfection topped with meringue. I cannot put this pie into words - but I did order one for Thanksgiving. My Mother-in-Law quickly announced to the table, it's like eating a creamy Werthers Original. When I asked Jeff about this pie - he told me they tested two dozen revisions of this pie before this recipe stuck. While they use many original Goody Goody recipes at the restaurant, this is one they modified. The original was so thick your fork would get stuck in it. There may be a throwback pie coming up in the future, offering a taste of the original - so be sure to keep up with Goody Goody on Social Media! You can also order a pie for Christmas - click here before 12/19 to place your Goody Goody pie order. 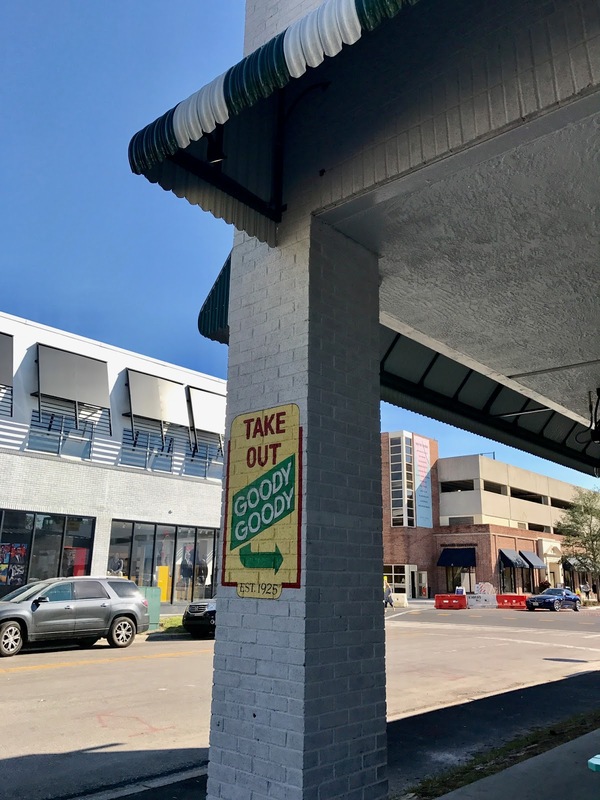 Goody Goody recently opened a take out window offering a smaller menu for those on the go or not wanting to wait for a table. There is no question that this convenience window will go over very well in Hyde Park, especially this time of year when everyone is out shopping. Now, I cannot say this was a nostalgic experience being I never tried the original Goody Goody - but I can say this will not be the last time I will visit this amazing restaurant and pig out on a POX. Don't take my word for it - download the app NoWait so you can reduce your wait time and bring your family so you can try multiple things! I personally can't wait to go back for the egg stuffed meatloaf!